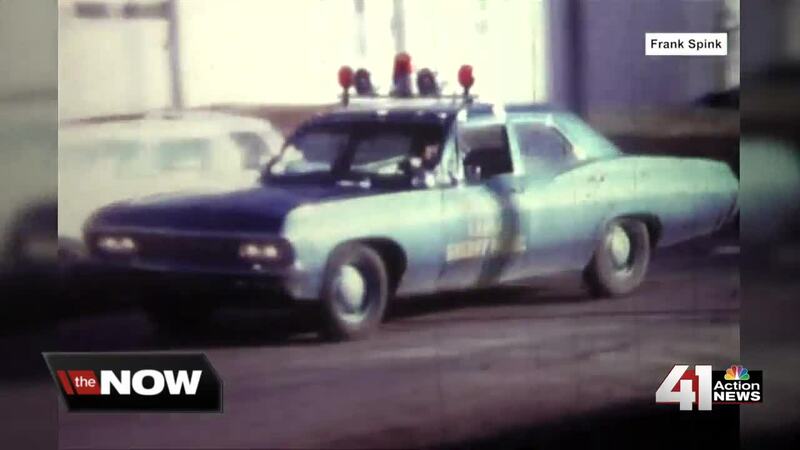 KSHB reported in September on the 50-year anniversary of a bombing, bank robbery, and fatal shootout in Overland Park. 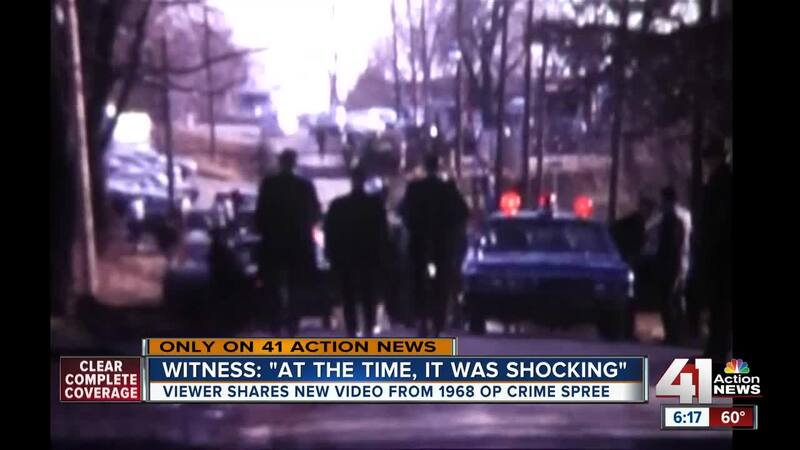 A viewer reached out with video he shot on a Super 8 camera, the day of the crime. OVERLAND PARK, Kan. — In September 2018, 41 Action News anchor Taylor Hemness reported on the 50-year anniversary of a major crime in Overland Park's history. Four men and women bombed city hall and robbed a bank on Metcalf Avenue before one of them engaged in a fatal gunfight with law enforcement officers. After the story aired, a viewer named Frank Spink reached out to KSHB to share video he'd recorded on the day of the crimes. Spink bought his Super 8 camera, used, when he was a teenager, and it quickly became a hobby. "I usually carried it with me everywhere I went," Spink said. In January of 1968, he found himself in the middle of one of the most notorious crimes in Overland Park's history. Henry Floyd Brown and Andrew Gipson had bombed city hall and robbed Metcalf State Bank, and police were spread across the city looking for them. "There were a lot of people there because they put out a bulletin on the radio or something," Spink said. Police found Brown at the Heatherwood Apartments on Robinson Drive. Sandy Krumm lived there at the time. "All of a sudden, someone's knocking at the door, and it's a policeman in the hallway," Krumm said. "And they said there's been a bank robbery, and they think that the suspects may be in this apartment area, and they're checking all the apartments." Sgt. Eldon Miller of the Kansas Highway Patrol was killed in the shootout at that apartment. Frank and his camera captured incredibly close images of the frenzy that followed, including armed detectives in the streets, and police taking fingerprints inside a suspected getaway car. "I just went over there," Spink said. "I thought it was neat... I'd never done this before. I kind of blended in." "At the time, it was shocking to think they were people who were able to do what they did," Krumm said. "And live right next to us in a lovely apartment building, in the middle of Overland Park, Kansas." Frank's Super 8 video captured part of that feeling. Please note the video has no sound. "Right away I had a friend say, 'You ought to let Channel 41 know you got that on film,'" Spink said. Frank told KSHB that he never shared the video with police, but kept it to show to friends. His love of the camera continued after that day. Spink recently retired after 40 years as a movie theater projectionist.